We’re having a bit of a conundrum with this wine. Actually it’s becoming more than just a bit of a conundrum – it’s an out and out mystery. About a month ago we discovered the 2005 Touraine Sauvignon at White and Gold: An Afternoon with Wines of the Loire Valley, a summer tasting organized by Liberty Wine Merchants. It was an instant hit – not just with the two of us but with almost everyone in attendance – because of its subtle yet distinct mint undertone. Yes, at first we questioned whether our palates were playing tricks, but everyone in the room had the same reaction. Mint, definitely. Very unusual, deliciously refreshing. A week later we bought half a case. Frank had the first bottle the next evening. No mint. Nada. A pleasant enough Sauvignon Blanc, but where was the mint that had captured our attention? A couple of days later, I took a second bottle to a patio party. I neglected to mention the mint to my fellow party goers, just asked if anyone could taste something unusual. Nope, just a nice, pleasant wine. No mint. It was beginning to sound like a classic case of bottle variation. The big question now becoming: was it the bottle at the tasting or the ones we bought that have the variation? Two to one against the tasting – a bit of a disappointment because we really did like the unique flavour. A call to Drew at Liberty got us no closer to a possible solution. He remembered the wine as being grassy and herbaceous – pretty much like you’d expect it to be – but no mint. Still we could certainly exchange the wine if we weren’t happy with it. Okay, we’d think about that option. We’d almost decided to take Drew up on his exchange offer when one of Frank’s co-workers and an always looking for something new in the wine world person phoned to thank him for the bottle of wine he’d passed along. She loved the minty taste – hadn’t actually believed him when he told her about it. Uh-oh, we’re back to two for two for the mint. Three bottles remain from our initial purchase. The good news is we know there can’t be a tie – and Drew definitely won’t be getting our bottles of this wine back. This is one mystery that’s proving far too much fun to give up on yet. – The picture above left was taken in 1923 and is of Fabel Barbou and his wife, great grandfather to Dominique Barbou who, with his wife Véronique, now runs Domaine des Corbillieres. 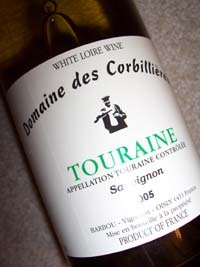 This entry was posted in Domaine des Corbillieres, French Wine, Loire Valley, Sauvignon Blanc and tagged Cabernet Franc, Gamay, Loire Valley, Pineau d'Aunis, Pinot Noir, Sauvignon blanc, Sparkling wine, Touraine. Bookmark the permalink. Please keep us posted on this. I loved this wine at a tasting (but was not aware of a mint note) and just recently bought another bottle that I haven’t opened yet. I will post back when I test bottle #2. Thanks for this info! !